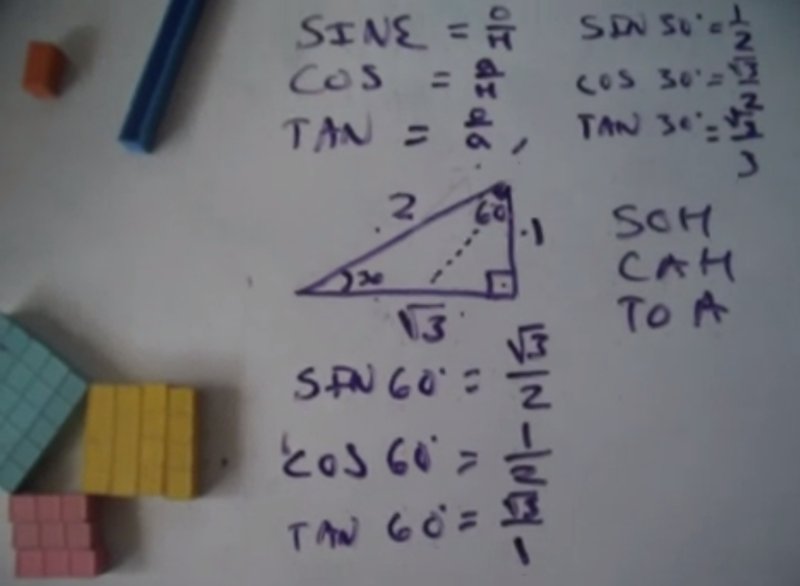 Here is a fast lesson on the special triangle that is 30, 60, 90 with a hypotenuse of 2. Later, when I talk about the unit circle and dividing all the sides by 2 it will already be somewhat familiar. In the picture above you can see the lesson on Pythagorean Theorem using the blocks to show a 3,4,5 triangle. And bring home the point that we have to take the square root to find the side it's not 25 it's 5 just as it's not 4 on the triangle we are studying it's 2. During the lesson which I failed to film I used the three period lesson to drive home the names of the sides and we used Pythagoras to help figure out what the hypotenuse HAD to be if the sides were 1 and √3...later I will take an equilateral triangle with sides of 1 cut it in half and talk about the special triangle that is formed. I did this but due to equipment malfunction the little boy accidentally ejected the battery while filming me we lost the lesson. I will record it again another day. I also think you should approach a lot of this as vocabulary, but not all of it. Many "just memorize it" when in fact you can figure it out if you know the definitions of the words, like hypotenuse: the longest side. We had a discussion about how not all triangles have a hypotenuse, and more. We already knew x/x = 1 so square root of three over square root of three (√3/√3 =1) being one wasn't a scary concept or hard to understand...he also understand the identity that when you multiply by one you don't really change the thing you multiplied although the symbols may change. Concept based teaching begins to compound. He also understood that √4 = 2...a common question is where does the 2 come from if the student doesn't fully understand Pythagorean Theorem...I made him do it on the white board (it got erased) at first we had √4 for the hypotenuse but that just a complicated way of saying 2....but the step should not be skipped. Here is a sample lesson where we learn a little math vocabulary. It's important to know what the words mean...in the mathematics the words sound funny to little kids because they come to us from the Greeks and from Latin...but the concepts are easily understood. 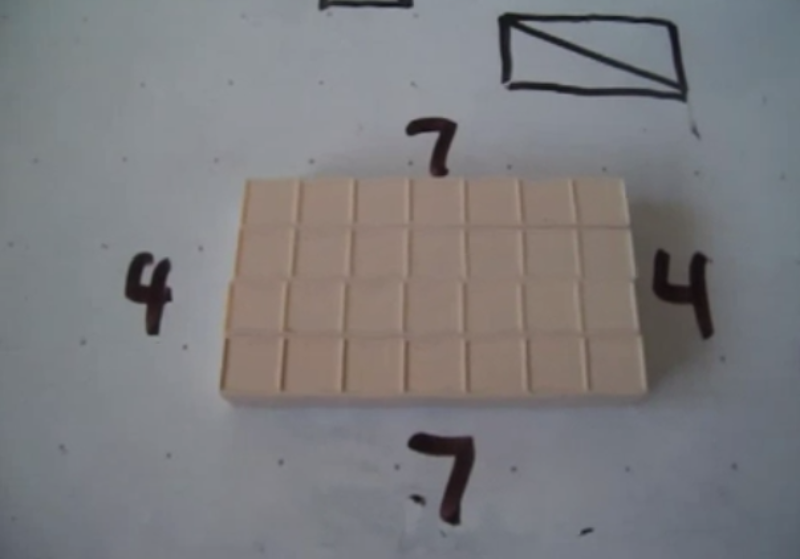 You should also be able to see how the concepts of area and perimeter NATURALLY lead to practice with addends and multiplication and division. This goes well with basic lessons about addition. I employ the three period lesson and you will note the repetition and lack of the word "no". If they get point to radius when I ask for diameter I tell them that's the radius show me the diameter...no need for the word NO. The vid is a little long but it's a useful as a sample lesson and will appear on the Sample Lessons page.